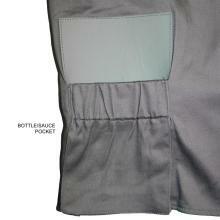 After cufflinks and belt buckles, here is my latest find for Father's Day. Summer is upon us, and lest you forget, so is Father's Day. Time for barbecues in the backyard and looking for a gift for Dad. 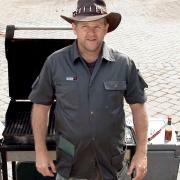 If you father is the kind who loves cooking up a storm in the kitchen, then the Weber Utility Shirt might just be the perfect gift for him. 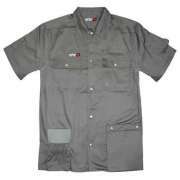 Weber is essentially a barbecue grill maker, and has introduced this shirt as a fashion innovation for men. 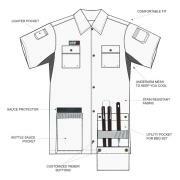 Based on the concept that ‘real men' not the metrosexual kind, would never be seen dead wearing an apron around the house, the Weber Utility Shirt provides all the pockets and features necessary to contain the tools and gadgetry a "real man" might require for the perfect cookout experience. 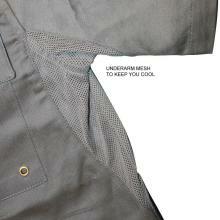 The shirt even has under-arm ventilation to keep sweat to a minimum and place for the most essential item - beer. The shirt is being sold online at the MillsGrills.com website for a paltry $30. Join GE’s #3DPrintMyGift Challenge & Make Santa’s Sleigh! Social Media's Largest Social Tribe Divests Its Exclusive Origins?